If your computer store many files like documents, photos, and videos, you should backup them for something happen in your computer. In case, we need a good backup software that can help us to store some important files. 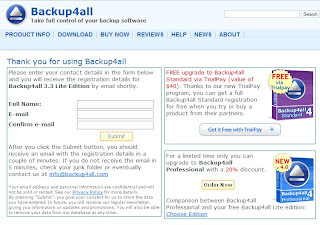 Backup4all is a backup software, it three editions available: Lite, Standard and Professional. Here, I talk about Lite version, it is basic backup tool, you can backup your files easily. unfortunately, Backup4all is not a freeware, Backup4all Lite costs almost $20 dollars, other versions cost more. Today, we can get Backup4all Lite version for free. How? It is easy to fill a form, you can get a registration code via email. Just copy and paste this address below into your browser address bar, go there to fill your name and email address. This offer from VNU Magazines. After few minutes you can check your email and find a registration code inside. If everything is right, you can download Backup4all Lite. Install software and use that code follow instruction of email.